Delaware City Schools Superintendent Paul Craft speaks to a joint assembly of Delaware City Council and the Delaware City Schools Board of Education Friday during the two groups’ regular joint meeting. Craft went over plans for additions and growth around the district, and he explained the two upcoming ballot issues that include no tax increases. 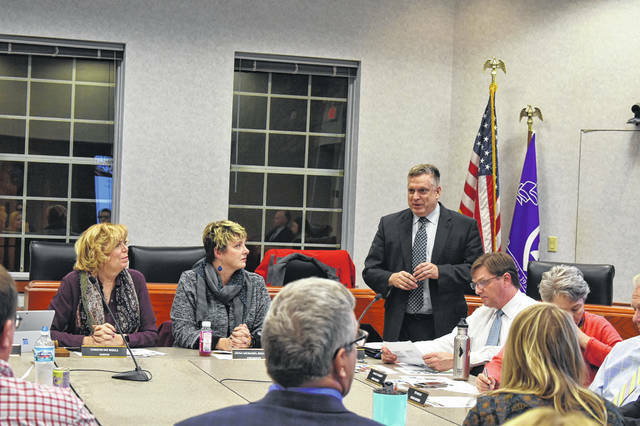 At the annual joint meeting between Delaware City Council and the Delaware City Schools Board of Education held Monday, Superintendent Paul Craft discussed the district’s decision to place two no-new-tax levies on the May ballot. During the meeting, Craft said the district would be placing a permanent improvement levy renewal and a no-new-millage bond levy on the May ballot to accommodate growth in the school district, but he stressed there would be no tax increase as a result of the issues. The permanent improvement levy deals specifically with things like school buses, building maintenance, technology infrastructure and textbooks. It was originally passed in 1989, Craft said. He added the permanent improvement levy has been renewed or replaced five times in the last 30 years to account for inflation. “It tells you that this community has a history of supporting the schools, and this is just a living example of that,” Craft said. The second ballot issue discussed was a no-new-millage bond levy, which Craft explained will generate $36.5 million for the district to do additions and modifications to buildings in the district to account for growth without going to voters for additional funds. Craft said the additions and improvements are still being planned and discussed, but they could include an addition to the front of Carlisle Elementary to create a more secure entrance; a small addition at Conger Elementary to account for future enrollments from developments like The Ravines at Olentangy or Terra Alta; a substantial improvement to the playground at Smith Elementary; an increase in preschool classrooms at Woodward Elementary School; renovation or replacement of the tech center at Dempsey Middle School; and renovations like finishes and cabinetry to the 2000 academic wing at Hayes High School, as well as an additional student seating area at the stadium. The district is also planning an addition at Schultz Elementary to meet growth on the southwest side of Delaware, but Craft said the city will require an additional road to Schultz to decrease traffic. He added the additions will also feature security and safety improvements. Craft said the district has a “big commitment” to no increases in taxes, and he hopes the district can go at least another three years before asking voters for more funds. Craft praised the “masterful work” of District Treasurer Melissa Lee for her work on the ballot issues. Craft said the district would like to go five or six years without a tax increase, but he added that depends on if the state legislature funds Delaware according to the state formula or if they leave the gain caps in place, which currently causes the district to lose out on millions of dollars in state funding. Craft told the joint meeting that the district has about 6,000 students, but it is funded as if it only had 4,000 students. Prior to the joint meeting, the board briefly met at the Willis Education Center, where it approved several staffing changes. The board approved the resignation for purposes of retirement of Rolf Remlinger, a music teacher at Schultz, effective May 30, 2019, and approved the resignations of Sarah Bowman, a cook/cashier at the district; Tiffany DeBarr, a bus driver for the district; and Kalene Thomson, a School Aged Child Care assistant site manager at Woodward. The board also approved the employments of Jesse Cowgill, a second shift custodian at Carlisle; Michelle Mikesell, a SACC Program assistant at Carlisle; and Shelby Salyer, a bus driver for the district. The board will meet next on Feb. 11 at 6 p.m. at Willis.